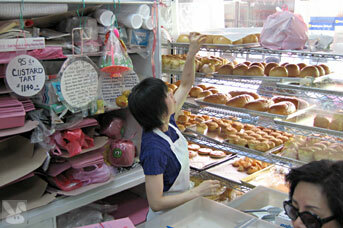 What kind of disoriented egghead doesn’t like a Chinese pastry? Not me. When I heard about the cult-like following of these little tarts, I popped over. Pretty generic looking for the nabe. 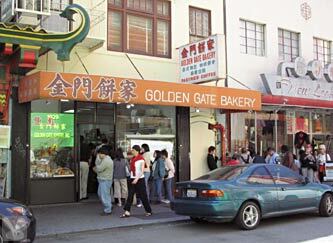 This Chinatown bakery does not stand out from the surrounding businesses in terms of appearance, but hey, you’re in it for the food, right? Don’t be shy, there may be a line outside, but when you make it inside, everyone mushes together toward the counter. Edge your way up and place your order. They may pass you by in favor of a regular, but stand your ground and get your baked treats. Hot from the ovens with their little hearts still beating; these flaky pastry cups are filled with a mildly sweet custard. Eat ‘em while their still hot. While good, they are not as fetish inspiring as the press they have gotten would suggest. There are lots of options in this bustling shop. 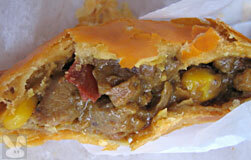 I tried a curried beef turnover while I was at it. 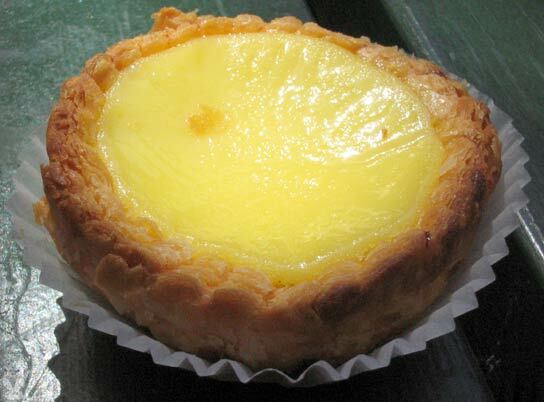 It was okay, but the buzz around this place is based on their famous fresh out of the oven custard tarts. I would certainly pick one up if I were in the neighborhood, but I don’t know if I would make a trip just for them. Two carrots out of four. Fun, funky place with good tarts. If you're in Chinatown, go inside and see if they'll serve you some.